One of the most ludicrous things about the anti-science movement is the enormous number of arguments that are based on a lack of knowledge about high school level chemistry. These chemistry facts are so elementary and fundamental to science that the anti-scientists’ positions can only be described as willful ignorance, and these arguments once again demonstrate that despite all of the claims of being “informed free-thinkers,” anti-scientists are nothing more than uninformed (or misinformed) science deniers. Therefore, in this post I am going to explain five rudimentary facts about chemistry that you must grasp before you are even remotely qualified to make an informed decision about medicines, vaccines, food, etc. This seems like a simple concept, but many people seem to struggle greatly with it, so let’s get this straight: all matter is made of chemicals (excluding subatomic particles). You consist entirely of chemicals. All food (even organic food) consists entirely of chemicals. Herbal remedies consist entirely of chemicals, etc. So, when someone says something like, “I don’t vaccinate because I don’t want my child to be injected with chemicals,” they have just demonstrated how truly uninformed they are, and you can be absolutely certain that they don’t know what they are talking about because all matter is made of chemicals. A “chemical-free lifestyle” is totally impossible. You can only survive without chemicals for 1-2 minutes, after that you will suffocate from a lack of oxygen. Right now, you are breathing in dioxide (aka oxygen) and your body is using that chemical as an electron acceptor for a process known as cellular respiration. This process takes carbohydrates such as glucose (which is a chemical) from your food, and breaks those carbohydrates down in order to release carbon dioxide (a chemical), water (also a chemical), and energy stored in adenosine triphosphate (ATP) molecules (still chemicals), and it is ATP which fuels your entire body. This process also involves numerous enzymes and electron acceptors such as acetyl coenzyme A and nicotine adenine dinucleotide (NADH), all of which are chemicals. Are you getting the picture here? You are a biochemical machine and every single thing that you do is driven by chemical reactions inside of your body. Even just reading this post is causing various chemical reactions inside your nervous system which are allowing you to process information. So there is no inherent reason to fear chemicals. You and everything else on this planet are made of chemicals and you would quickly die without them. It’s also worth noting that the length of a chemical’s name does not indicate how toxic it is. The internet is full of scare tactics and fear-mongering over chemicals with long scary- sounding names. For example, Vani Hari (a.k.a. the Food Babe) is famous for proclaiming that you shouldn’t eat anything that you can’t pronounce or spell. This is patently absurd. For example, consider the following chemicals: retinal, cyanocobalamin, ascorbic acid, and cholecalciferol. Having taught college biology and listened to my students butcher scientific words, I am confident in saying that a large number of people would struggle to pronounce those, and many of them would likely freak out over things like ascorbic acid which sound like they should be bad for you. In reality, those are simply the chemical names for vitamins A, B, C, and D. Similarly, all living things contain DNA, and as a result, virtually all food contains DNA, but DNA stands for deoxyribonucleic acid. Again, its a long, difficult to pronounce name, and it sounds bad because it’s an acid, but it is essential for life and it is in nearly all foods. It is naive and childish to base your diet or medical practices on your pronunciation skills. There is no such thing as a toxic chemical, there are only toxic doses. Let me say that again: essentially all chemicals are safe at a low enough dose, and essentially all chemicals are toxic at a high enough dose. This is a fundamental fact that people in the anti-science movement routinely ignore. Vani Hari is notorious for rejecting this fact by making claims such as, “there is just no acceptable level of any chemical to ingest, ever.” The reality is quite different. For example, everyone reading this currently has mercury, arsenic, cyanide, formaldehyde, aluminum, lead, and a host of other “toxic” chemicals in your body right now. Further, you would have those chemicals even if you had spent your entire life hundreds of miles from anyone else, ate only organic food that you grew yourself, never used pharmaceuticals or vaccines, etc. These are chemicals that are normally in our environment and we acquire them through our food, water, etc. Some of these (such as formaldehyde) are even produced by our bodies. Even radioactive chemicals like uranium are often present. So clearly there are safe levels of “toxic” chemicals since all of us normally have them in our bodies. Inversely, “safe” chemicals such as water are toxic in high enough doses. People have, in fact, overdosed on water. To be clear, they did not drown, they overdosed. Water is actually dangerous to your body at high enough levels. What is the toxic dose in humans? What is the dose in the product in question? Those two pieces of information are absolutely crucial for evaluating the safety of the product. You simply cannot know whether that chemical is dangerous without knowing the dose in the product and the dose at which it becomes toxic. So, if your friend, blogger, etc. cannot answer those two questions, then they have just unequivocally demonstrated that they haven’t done their homework and don’t know what they are talking about; therefore, you shouldn’t listen to them. 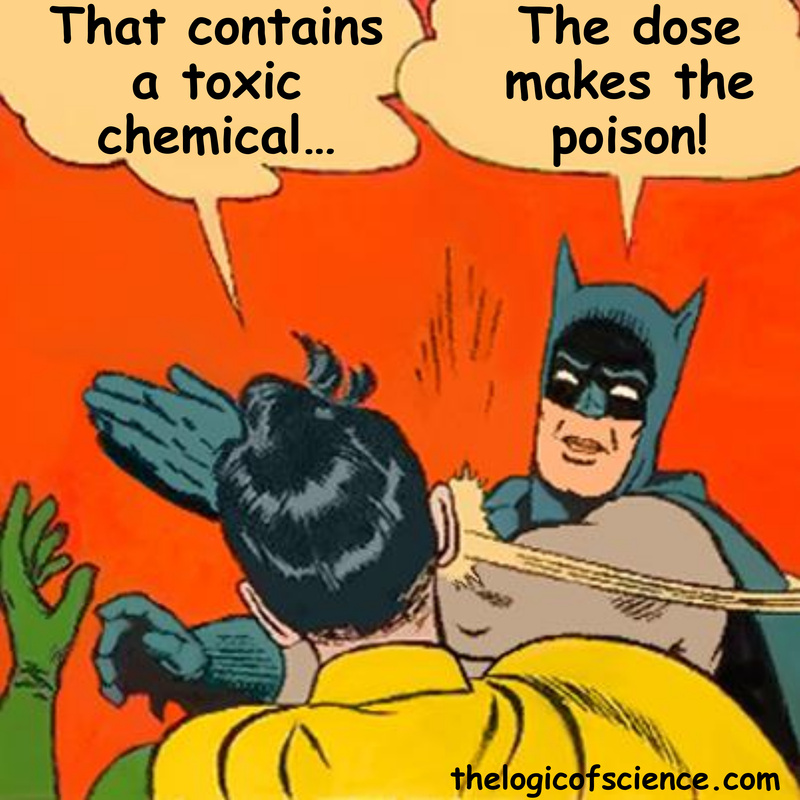 Indeed, a great many anti-science arguments crumble under the realization that the dose makes the poison. For example, we have all no doubt heard people rant about the “toxins” in vaccines, but the reality is that the supposedly toxic chemicals in vaccines are present in completely safe doses and, therefore, are totally safe. I often hear people claim that “synthetic” chemicals (a.k.a. chemicals made in a lab) are not as good for you as their “natural” counterparts. The reality is that this represents a misunderstanding of literally the most fundamental concept of chemistry. The most basic unit of matter is the atom (again, excluding subatomic particles), and there are several different types of atoms known as elements. We combine these elements to make various molecules, and the combination of elements determines the molecule’s properties. The process by which those elements were combined is completely and totally irrelevant to how the final chemical behaves. For example, water (a.k.a. dihydrogen monoxide) consists of three atoms: 2 hydrogens and 1 oxygen (hydrogen and oxygen are both elements). There are literally thousands of different chemical reactions that will produce water. In other words, we can make water thousands of different ways, but water always behaves in exactly the same way no matter how it was formed because it always consists of the same three atoms. Further, if given a vial of pure water, there isn’t a chemist anywhere in the world who could tell you how that water was produced because it would be completely identical to all of the other water everywhere on the planet. So, as long as the chemical structure is the same, it doesn’t matter if the chemical was extracted from a plant or synthesized in a lab. I often encounter people who will claim to agree with everything that I have said thus far, but they still insist that “artificial” chemicals (a.k.a. chemicals that simply are not found in nature) are bad for you and shouldn’t be consumed, injected, etc. There are several critical problems here. First, remember again that esentially all chemicals are dangerous at a high enough doses and safe at a low enough dose. That is just as true for artificial chemicals as it is for natural chemicals. Second, this claim is nothing more than an appeal to nature fallacy. Nature is full of chemicals such as cyanide and arsenic that are dangerous at anything but a very low dose, so there is no reason to think that the “naturalness” of a chemical is an indicator of its healthiness. Further, remember that chemicals are nothing more than arrangements of elements. There is absolutely no reason to think that nature has produced all of the best arrangements or that we are incapable of making an arrangement that is safe or even better than what nature produced. I constantly hear people say that we cannot improve on nature, but that is an utterly ludicrous and unsupportable claim, and I would challenge anyone to give me a logical syllogism that backs it up. Really think about this for a minute, if you are of the opinion that artificial chemicals should be avoided, try to defend that position. Ask yourself why you think that. Can you give me any reason to think that they are bad other than simply that they aren’t natural (which we have just established is a fallacy)? Chemical compounds are made by combining different elements or even molecules, and the final product may not behave the same way as all of its individual parts. Sodium chloride is a classic example of this concept. Sodium is extremely reactive and will literally explode if it contacts water, and chlorine is very toxic at anything but an extremely low dose. Nevertheless, when we combine them we get sodium chloride, which is better known as table salt. Notice that table salt does not have the properties of either sodium or chlorine. It does not explode when it contacts water and you cannot get chlorine poisoning from it no matter how much of it you eat. The combination of those two elements changed their properties and it would be absurd to say that “salt is dangerous because it contains sodium.” The sodium in salt no longer behaves like sodium because it is bound to the chlorine. Therefore, when you hear a claim that something contains a dangerous chemical, make sure that the chemical isn’t bound to something that makes it safe. This entry was posted in Nature of Science, Vaccines/Alternative Medicine and tagged anti vaccine arguments, appeal to emotion fallacies, appeal to nature fallacies, Bad arguments, evaluating evidence. Bookmark the permalink. I’m surprised this article didn’t differentiate between “organic” and “inorganic”. Its known that there is organic matter that can be toxic, and inorganic matter that can be beneficial. That being said, when this relates to our food supply, great caution should be observed when our bounty is enhanced with methods and materials which are imposed simply to create more yield. We are still quite ignorant of the long-term impact of how this effects our food, water and air, but we are certain of how other “chemicals” do impact these three things necessary for survival.